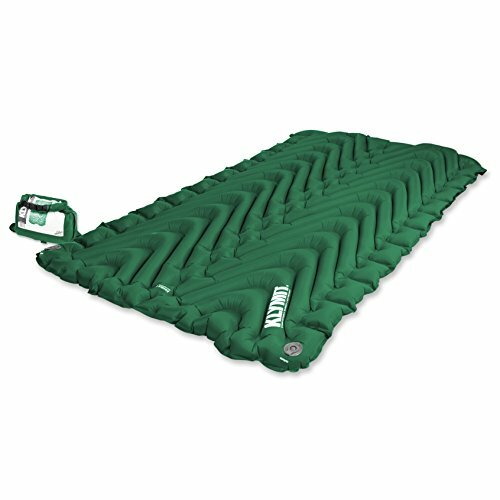 Klymit Double V (Forest Green): Because it takes two to tango, Klymit designed the Double V a two-person sleeping pad engineered to the same standards as its award-winning Static V collection. Though the Double V is rugged enough for direct ground sleeping and stargazing (hint, hint - what a romantic date), it also fits perfectly into a 2-3 person tent. Like Klymit's other sleeping pads, the Double V includes ribbed "V" body mapping fabric, meaning there's no chance you slide off during the night. But setting the Double V apart from Klymit's other pads is the sleeping pad air pump built into its stuff sack - no need to manually blow this thing up. Time to ditch the separate pads you're carrying and add the Double V to your couples' camping checklist. Light enough to take backpacking at 40.5 oz. Dimensions: 47 x 74 x 3"
Pack Size: 9 x 4 x 5"
Lightweight and durable backpacking mattress for two perfect for camping, backpacking, or the spontaneous overnight trip. Sleep outside as comfortably as you do in your own bed: made from 75D Durable Polyester, the Double V features a V Chamber design that limits air movement even if your partner tosses and turns. Self Inflating: The included stuff sack doubles as a manual pump to fill the Double V in about 8-10 pumps. Deep Weld Patterning: Unlike traditional pads that flatten the bag's fill, deep welds create expansion zones that allow your bag to fully loft beneath you for improved thermal comfort.